His party did not win and Hun Sen still has majority power (although greatly reduced**). 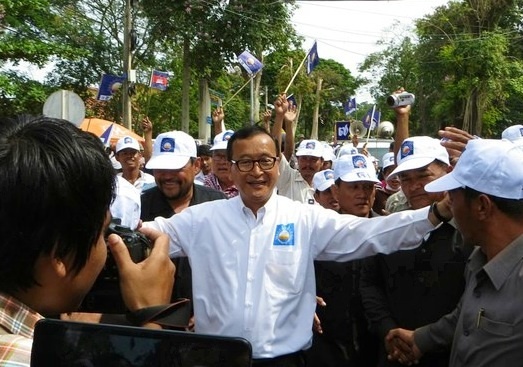 But this is okay, because Sam Rainsy is not the savior of Cambodia. Is Hun Sen a good guy? Well, click here to read for yourself. But I am personally happy with the election results. If you study Cambodia’s history you will see that ever since the fall of the Khmer empire this small country has always seemed to be in the middle of someone else’s conflicts–Vietnam and Thailand, France and Thailand, the USA and Vietnam, the USA and China. And then there was that whole Khmer Rouge thing. As a result, Cambodia has not enjoyed any kind of lasting stability for hundreds of years. For the last fifteen years or so Cambodia has had some measure of stability, more than its had in a long time. Older Cambodians support Hun Sen because they remember well the Khmer Rouge days and they are very happy with where the country is at now, and they credit this to Hun Sen as he is the one who’s been in power for the last three decades. Younger Cambodians have no memory of the Khmer Rouge days as they were born afterwards. They only see Hun Sen as a brutish thug who needs to be replaced quickly. But at this time an abrupt radical change in the Cambodian government would only bring more instability, and most likely more violence. Those of us who are Christians know and trust who is really in charge. And in trusting God we can be patient and not foolishly rush into a humanistic kind of radicalism which sees political figures (and the UN, and the USA) as saviors. What about Hun Sen? God will judge Hun Sen. And as the Gospel spreads, and the Cambodian people are shown the light of the truth, the condition of the government will follow what the people believe.